Traditional wedding rings are not my thing; to me the shiny heavy metals are somewhat impersonal and boring, not to mention expensive. I therefore decided to have a go at making my own (how hard can it be!?) Making Emma’s engagement ring seemed to be a success, so I started planning. Wedding ring materials. This the a branch of yew wood that I found had died from lack of light right in the centre of the canopy. The block of metal is a zinc alloy, and the base ring tarnished to its dusty blue. The first step was to decide on the materials and general look. I don’t have much experience with foundry-based methods, so thought I should stick to CNC milling and lathe-based methods that I’m more familiar with. 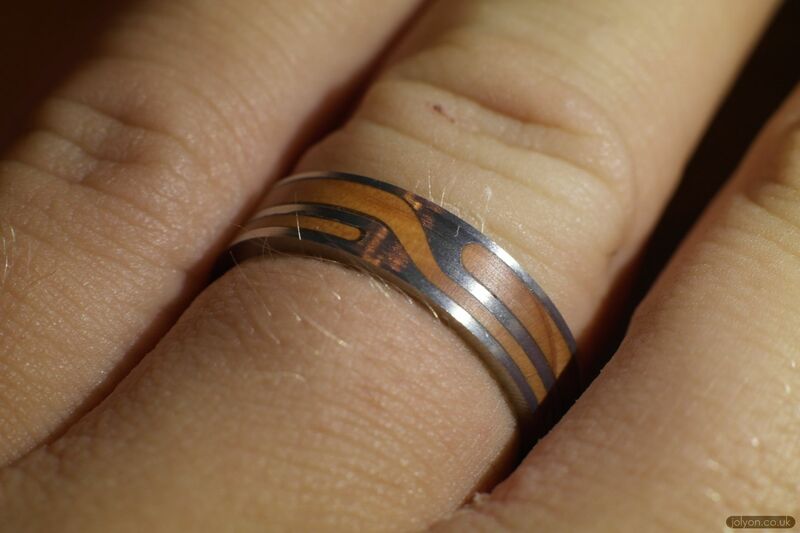 I’ve seen some lovely looking wooden rings online, and even seen friends’ wooden rings. Wood comes in lovely colours, and each piece is unique. However, most types of wood aren’t very hard wearing (at least over decades of wear & tear). So some metal was probably also called for. Brass was my first thought for the metal base – it’s strong, easy to machine, and can last years. It also tarnishes to a dusty yellow that’s very nice, or you can lacquer it to keep it shiny. Then I saw the zinc alloy metals, some of which are very strong and easy to machine, but have a lovely white/blue colour, and tarnish to a dusty grey/blue that I really like. They’re also hypo-allergenic, so shouldn’t cause an skin irritation. 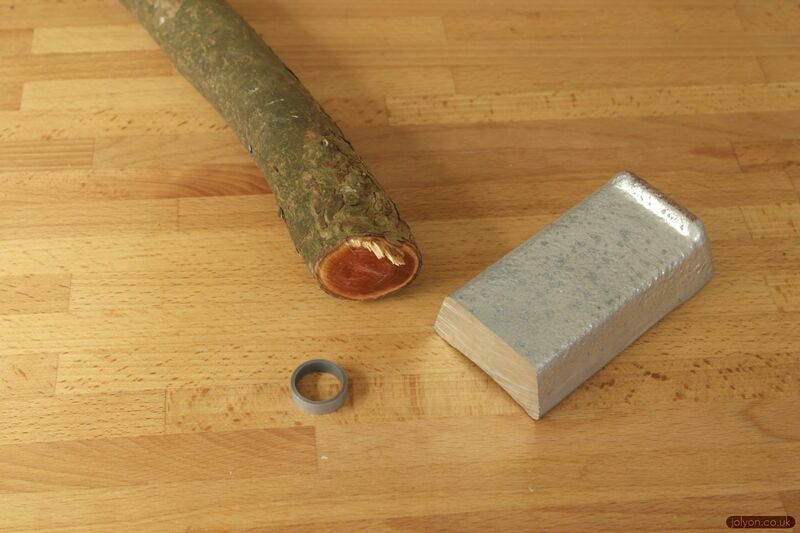 The choice of wood was quite interesting – I wanted a native UK species that I could source locally. Oak is of course strong and hard, but the open grain and colours don’t excite me. Beech trees are some of my favourite, but again I’m not a huge fan of the colour. Then I thought of yew, which has some impressive properties for softwood (info). Very strong and flexible, with a fine grain that’s easy to turn and lovely variable colours. It’s also highly toxic, but once treated this will all be locked into the wood. Watch the video to see the whole process. This doesn’t show the final steps of sanding and polishing to get the ring even more smooth. Love the ring! And top skills with a lathé!